Disney squeezed two films into 2016. Zootopia was a satisfying twisty mystery with a broad and often hilarious animal cast, while Moana offered a very focused ocean quest story with a far smaller roster. While I certainly liked Moana, admired the decision to explore a culture Disney hasn’t touched before, and had much to celebrate technically, I can’t call it a classic – and nor do I think it will endure. In fact, having just read that directors Clements and Musker (helmsmen of Little Mermaid, Aladdin and Hercules, amongst others) wanted to adapt Terry Pratchett’s Mort but came up against rights acquisition issues, I have to admit wishing they were able to do that instead. The progressive nature of Moana has been trumpeted enough it almost feels like criticising the piece is tantamount to being racially insensitive, but in general it’s the Polynesian elements that really shine through here. Moana herself is a superb character, likeable, believable, shaped by her background but with plenty of her own personality, too – and not just because of her little pithy comments, either. I loved seeing the animated tattoos, the supernatural manifestations of natural forces and the mythological evils. The evocation of the wonders seen by seafaring tribes was great, and there was some superb music, too – even if my favourite was the rather Bowie-ish ‘Shiny’ number that was decidedly non-Polynesian. For me, the problem was firmly with Maui, a figure central to Polynesian mythology and a secondary character with more screentime than many Disney protagonists. He absolutely needed to be strange, formidable, a little otherworldly but most importantly, extremely likeable. And for all The Rock’s best efforts and for all the tattoos helped, he just wasn’t likeable. He was slow-witted, self-absorbed, violent, reckless and didn’t really grow or learn even as he warmed to Moana. 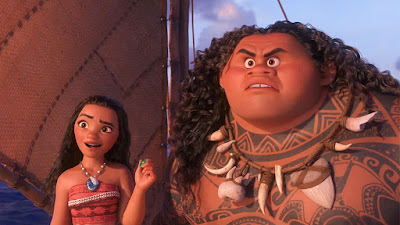 He was oafish and occasionally murderous, and for all the Moana herself was the real hero of the piece, he was the one with the superpowers, he was the one who drove the plot and he was the one who gained the most from the events of the story – if anything, he was a big patriarchal power symbol around which vaguely feminist themes had to twist themselves. And he was no Genie or even a Wreck-It Ralph, a character it’s fun to see through the whole movie even with their flaws. He was just not interesting or compelling at all. So with only Moana herself and a very straightforward quest to carry the film, it felt very light in the plot department. Certainly not a bad film, but nowhere near the best of these directors’ output, or that of recent Disney releases. I'm really glad to find someone who feels the same about Moana as I do: I would have found the film more than just "decent" if Maui was a more likable character. Even from the beginning when he stole Moana's boat and left her to die on that island (it was bad enough leaving her there, but trapping her in a cave too? ), I was like "hmm, this guy's kind of a douche." It's not uncommon for protagonists who first meet to not get along, but there's a difference between exchanging banter, etc, and attempted murder! But even after that he was still a jerk to her: all he did was continually put her down and try to get rid of her - this was portrayed as humorous, like how he kept trying to toss her into the ocean only to have the ocean bring her back - but when you're trying to take the story and characters seriously, it comes off as pretty unlikable behavior. When I watched the movie a second time, I really tried to find any trace of Maui showing that he cared for Moana during the first 2/3rds or so, but I couldn't find any. Literally the only time he was nice to her was during that, like, 5 minute montage of him teaching her how to sail towards the end of the movie. But then that was kinda ruined when he abandoned her after their first encounter with Te Kaa, only to come back a little while later with no explanation as to why (knowing why he decided to come back would have definitely helped his character). His actions would have been more understandable if they portrayed him as this vindictive, angry demi-god who hated humans or something like that, but his whole shtick was that he wanted to do everything to help humans and be worshiped by them. If that's the case, he's certainly not treating the human he first meets after such a long time very well at all! Maui not being the likable character he should have been did indeed hurt my overall enjoyment of Moana. I also had a few other issues with the movie, like the cute little pig Pua getting totally shafted in favor of the less cute HeiHei (his stupidity being his only trait) and I found that whole scene with Tamatoa to be uncomfortably strange (sorry, I know you like the song!) But I guess I still like the movie a bit more than not: I liked the setting, I love the songs, and I liked the first act of the movie even if it did have the typical Disney set up of "protagonist wants to be different but parent doesn't want them to do the thing they want to do." The ending was pretty cool too. But yeah, the movie overall could have been better. Great to hear from you! I often read your blog too, when you post. Glad to hear your thoughts were similar to mine. Maui was definitely the real weak point here. And yes, I liked 'Shiny' but the actual sequence was pretty jarring to the plot overall.